My daughter’s cherished red teddy bear has been lost. He is a Spider-Man themed bear from build a bear. He is red with blue spider webs. Large Jellycat Bashful Bunny, Cream. Well loved so quite worn, grey with slightly matted fur. Last recalled sighting at the entrance to Palace Pier before proceeding to walk to English's restaurant via Pool Valley - East Street. Not at English's and have scoured the streets with no luck so far. Found this little blankie hippo on the footpath into Beaconsfield M40 services! He would very much like to get back to his owner! Much loved Bunny. Quite small and very worn. My little girl is devastated-it’s like there has been a death in the family. We visited Bristol and she last remembers having him at and around the SS Great Britain. We also spent time around the harbour as well as Victoria Park in Bath. Please help! 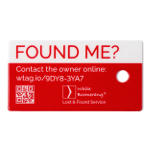 Found Fri 12th. Bear is confused & hungry (allergy policy in place here) He needs his family ASAP. We have been giving him cuddles and chatting but he wants to go home and on teddy bear picnics again. Please contact customer service desk, Stratford City. Our daugthers sheep got lost in or around Castle Hotel in Billund the 18th of April. Bä is a bit more worn now than on the pic. Found at back of Premier Inn carpark by fence near field with alpaca. V. Muddy Bebo Grey Bunny comfort blanket. He has had a bath and is much less muddy. Will leave at premier inn reception tomorrow. 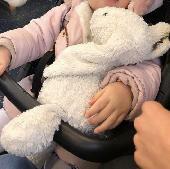 Small Jellycat sheep, found by side of road near Leith Asda. Lost Jellycat Elephant answering to the name of Dumbo. My daughter has had him since birth nine years ago and is inconsolable. If anyone can help! He is a well loved stuffed turtle. Has large scratched eyes. Very little stuffing. Has rips in his neck and flipped. No tag on him. 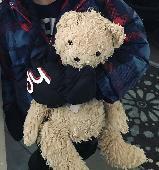 I am a well loved teddy bear who flew from Malaga to LGW arriving on 20 April 2019. I may be still in Malaga Airport. 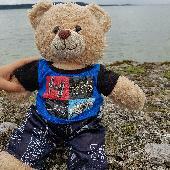 I am a brown teddy with a distinctive blue UNICEF wording on my foot. Please help me to be reunited with my owner in London who misses me very much! My 6 year old son is distraught having left his beloved teddy in the Holiday Inn, Dijon. Unfortunately the Teddy was left in the hotel room upon checkout. The following afternoon we realised it was missing, but it appears no one has handed it in. This little brown bear appeared on our wall on New Year's Day. We left him there at first in the hope his humans would come back and see him. He disappeared and I thought he must have been picked up, but it turns out he'd taken up residence in the hedge. I found him again yesterday (16 March) in need of some TLC so he's had a hot Dettol bath and is now looking a lot healthier. Hoping someone's still looking for him... We'll take care of him until he's reunited with his humans!